The Southern Resident Killer Whales Need Our Help! 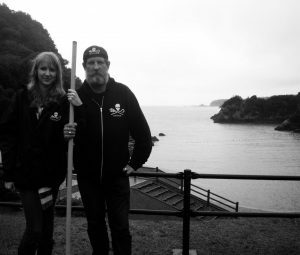 When I was sixteen-years-old my father and I traveled to Taiji, Japan, and spent three months documenting the slaughter of dolphins and small whales at the infamous Cove located in the Wakayama Prefecture. It would be the first of two trips I would take, before the Japanese government considered our photographing and writing about the events unfolding were acts of terrorism. My awareness and involvement surrounding environmental issues did not originate in Taiji. Growing up, my father worked as Special Agent-In-Charge with the Environmental Protection Agency, and my mother homeschooled my sister and I before taking over as the executive director of Sarvey Wildlife Care Center (a wildlife rescue and rehabilitation center). You could say that the odds were stacked against me. I was destined to follow in their example. I would say, after having become aware of the issues facing our planet and witnessing atrocities first hand, that not making an effort to change the world, however small it may feel, is a perpetuation of the problem. I have lived in the Pacific Northwest for over ten years. I learned to scuba here. I have spent hours wandering the beaches, hiking trails, and have even rescued and released wildlife here. I have also spent time on the water – whale watching and falling in love with our Southern Resident Killer Whales. Having spent so much time traveling the world, attempting to right injustices with likeminded individuals, you can imagine my surprise when I learned that the whales in my own backyard are at risk of extinction. I have come to learn in my short life that tackling the problems in our communities is the most sensible first step to change. This is why I am writing to you: residents of Washington, the San Juan Islands, and anyone else reading this blog who value the biodiversity and the rich and magnificent landscapes and waters surrounding the Pacific Northwest. We have a problem. Our Southern Resident Killer Whales are threatened with extinction. Orca Relief Citizens’ Alliance, Center for Biological Diversity, and Project SeaWolf have filed a regulatory petition with the National Marine Fisheries’ Service. The petition, which asserts the need for a Southern Resident Killer Whale protection zone (WPZ), would allow for the endangered Southern Resident whale’s to have the peace and quiet they need for socializing, hunting, and resting. The Southern Resident Orca population is rapidly declining in number. This last week, Ken Balcomb of the Center for Whale Research announced the death of J28 and her one-year-old calf. Orca Relief recognizes that the Resident Orca population has declined by 12% since 2005, and the National Marine Fisheries’ Service states that the J, K, and L pods, of the Salish Sea, are the smallest population recorded since 1985. The threat of extinction is approaching. Threats against the Southern Resident Orca’s are starvation, pollution, and stress generated by consistent boat noise. The University of Washington has found that motorized boat traffic impact the whales’ sonar abilities – which in turn affects their ability to hunt, which becomes more critical when the Chinook Salmon count is low. Potential removal of the existing dams in the Pacific Northwest will go a long way towards repairing the problem of few salmon: however it is not enough. The Southern Residents need a protection zone located in their hunting waters, the Haro Strait, off of the San Juan Islands, in Washington State. When I learned that the boat traffic from whale watching vessels were a contributing factor to the rapid decline scientists were documenting, I was worried. I know how important it is for people to get out on the water and witness these incredible animals in their natural environment, and not in a concrete tank. However, Orca Relief and partners do not oppose all motorized water activity. Their argument is that the boats, which actively follow whales, for the purposes of whale watching, are amplifying the already existing stress the whales face from other motorized activity. 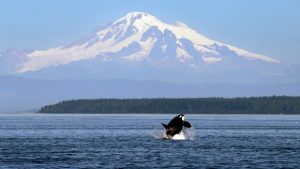 Orca Relief and partners are suggesting a permit system, which would limit the number of whale watching vessels allowed near the whale populations anywhere in Puget Sound. Of course more education and enforcement is needed for such a protection zone and permit system to exist, and this is why Orca Relief has called on the National Marine Fisheries’ Service to take the proper steps needed in protecting the Southern Resident Killer Whales. Like with most things, a balance is necessary. We can continue to appreciate the Southern Resident Killer Whales, without overwhelming them too much. Give the Resident Orca’s a protection zone. Safeguard these remarkable creatures and give them the space and time they need to thrive again. The regulatory petition will be a forum style. Anyone interested in the conversation will be welcomed to submit their ideas, concerns, or information to the NMFS. To show your support for the protection of the Southern Resident Killer Whales, sign the public petition generated by Orca Relief. Click here. To review and support the regulatory petition, download a copy here.